This listing is for a printable PDF pattern! My son likes to be original and unique. He asked if we could make something cool for his date's corsage for the prom. So one night I got out the felt and we had a fun late night experimenting. We came up with the cutest, unique, one of a kind corsage. Who would have thought that FLEECE would be a great medium for making flowers? Well, it is! Just think of all the fun gifts you can make up. This 8 page pattern tutorial is loaded with photos and easy to follow instructions for you to make SIX different flowers. 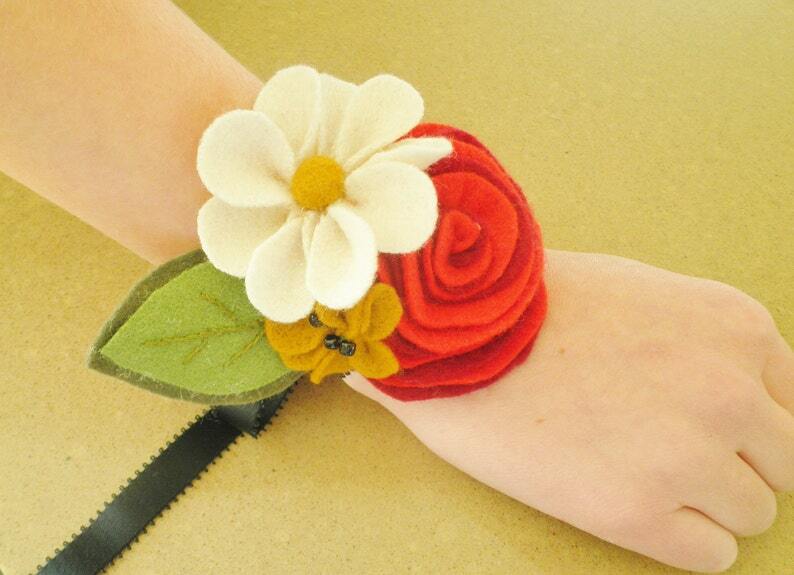 Make a bouquet, corsage, or embellish any accessory. Pin one to your hat, purse, your daughters headband, hair clips, etc. The possibilities are endless! INSTANT DOWNLOAD - When your payment has cleared, an email will be automatically sent to your email address connected to Etsy. You will then be directed to your own download page. Please contact me if you have any problem downloading your files. This is a digital pattern and once I send you the files, the sale is final. No refunds will be given. Please send me a note if problems or concerns do arise. © jhowell 2012. All rights reserved. These documents are for PERSONAL USE only. Please do not distribute, share or resell any of the files included. Jhowell Copyright 2013. Finished items may be sold, I just ask that you give credit to my shop (www.fibersandtwigs.etsy.com) for the pattern. Any 3 Patterns - iNSTANT DOWNLOAD! Any 2 Patterns- INSTANT DOWNLOAD! I'm sorry but due to the nature of an e-mailed PDF Pattern or PDF File, there will be no refunds after you have received the pattern. If you are not completely satisfied with your order, please send me a note and we can work something out. Please note that a pattern purchase from my shop is also an agreement to never re-write, re-sell, or distribute the patterns themselves. If you do choose to sell any the finished products from my patterns online I do ask that you give my shop (http://www.fibersandtwigs.etsy.com) credit for the pattern. Reselling, Rewriting or distributing the pattern itself is prohibited. Thank you so much for your consideration. any FIVE patterns - INSTANT DOWNLOAD!